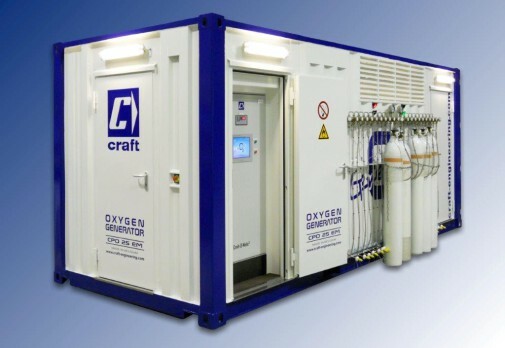 Craft® offers a two-stage diaphragm compression unit for pure oxygen, adapted to the medical or extreme industrial environments. All of the components are mounted in a modified maritime container which serves as a technical room, with two access doors and a digital screen control panel. The container is equipped with interior and exterior lighting. The container represents and excellent shelter against intrusions of all types (dust, rain, theft). It allows the CPO units to be operational with all doors closed. Designed to be installed outside, its ventilation system guarantees the system efficiency, whatever the ambient temperature and humidity. Similar, in appearance, to any maritime container, it considerably facilitates the transport of the unit. Furthermore, it can be mounted on a classic trailer, giving it exceptional mobility. Our medical Oxygen units operate with a PSA system and a diaphragm compressor. They only require maintenance every 8,000hours of operation. Screw compressor, lubricated, single-stage of type GA-Workplace equipped with a water separator and air-cooled. It has integrated oil and air cooling, in aluminium A microprocessor integrates the functions of regulation, control and safety. A filter eliminates impurities down to 0.01 micron, with a maximum residual oil content of 0.001 ppm. The air is then stored in a buffer tank. VT type dryer with heat exchanger. The dewpoint is 2°C. Generator of type PSA with molecular sieve, it is entirely made of stainless steel. All the auxiliary equipment in contact with oxygen (tanks, valves, pipework, etc.) are also in stainless steel. The regulation by an automatic control system with pneumatic commands allows millions of cycles to be performed At the outlet of the generator, the dewpoint can go down to -75°C. The digital control table, regulates the order of the electric power phases, forbidding start-up in case on the reversing of phases. It also monitors the regulation of the compressors and the generator. In addition, the table allows the air and oxygen pressure to be viewed and the dewpoint of the air to be displayed. It comprises a system for the measurement of oxygen quality and indicates potential system malfunctions. High pressure cylinder filling station distributed into 2 sections, each comprising 5 to 10 filling couplings with high pressure cut-off valve, bottle cut-off valve and quick-connect stainless steel/Teflon filling coils. Servicing required every 8,000 Hours, Electrical consumption also lower. More efficient measurement system, providing a more accurate gas diagnosis. What solution to user for your industrial projects? How do we obtain these results?